another from my Bride of Frankenstein shoot with the fabulous VoodooSugar. Feature in the news Just a Different Love Story. Wow, the hair is so perfect! haha... thanks, I'm glad that you like it! the photographer fixed it up a bit in post. I think she did a frikkin' awesome job with it. and does it work with some kind of wire bay? wow, I found you. I just edited two of your pictures. I found them on photobucket and just had to edited them. if you want the link just contact me back. well... I'm flattered that you liked my photos. however, the copyright on them actually belongs to the photographers, so please get their permission before you edit them. where could I get their permission? I have the links to most of the photographers in the "artist's comments" section for each photo. if I didn't put it on one of them... just let me know and I'll fix it. Never has a(n) (un)living creature been so BEAUTIFUL since Elsa Lanchester! I have to agree with you 100%. I think Elsa would be very proud of these photos. 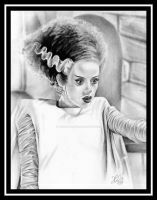 I am also a HUGE Bride of Frankenstein fan! I think she's gorgeous! Hot, even! (tho everyone thinks I'm nuts!) Anyways. I love, Love, LOVE this photo. You are beautiful. I love everything about it. yay! me too, she's just beautiful! yes she is. lol. I think i'm going to be her for halloween. love your pinup pics too! Far awesome... I like it so so so much that I can't stop contemplating... somposition, shadows and plain colors... everything just amazing! thank you so much! I'm glad that you enjoyed it so much! Amazing! I especially love the stitches! It's the little details that make it that much more great! I like it a lot! thank you very much! I'm extremely pleased that people seem to like these shots. 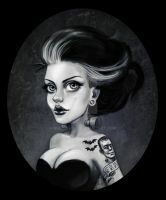 I'm a huge bride of frankenstein fan. You are welcome! It really is awesome! Great photo in Black and White. Stylish! OHHHHHHH you did put up more Most excellent...I had to go back and check out the other one... I really think this one in my opinion is the winner of the two. I like the closed body shape to this one hence for the "reluctant" part.. and just you holding your head downward like that enhances the height of the hair that isn't even showing. WONDERFUL.... was there a Frank in any of the shots...you could of played off that KILLER! unfortunately, no Frank in this shoot. but the photographer and I are talking about doing another one with a fantastic model that I haven't been able to work with in awhile. OH boy! What a sweet shot! Keep up the great work doll! Love the contrast in the image. Now I see where my sharpie went.